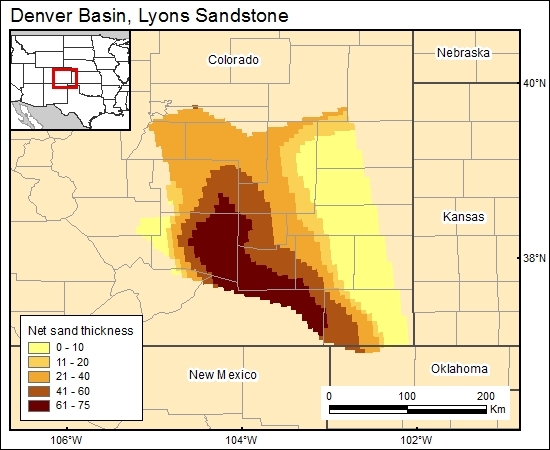 The thickness map approximates the net-sandstone map (c4lyonsg) in the west part of the area because the Lyons Sandstone should be close to 95 percent sand. The amount of sand should decrease to the east where the Lyons consists primarily of interbedded red beds and evaporates, as is described later in the sand-body continuity section. Garbarini, G., and Veal, H. K., 1968, Potential of Denver Basin for disposal of liquid wastes, subsurface disposal in geologic basins—a study of reservoir strata: American Association of Petroleum Geologists Memoir, p. 165–185. Levandowski, D., Kaley, M., and Smalley, R., 1973, Cementation in the Lyons Sandstone and its role in oil accumulation, Denver Basin, Colorado: American Association of Petroleum Geologists Bulletin, v. 57, no. 11, p. 2217–2244.